Morbier is made in the Franche Comté region of western France using cows’ milk. It has a soft, smooth texture and a lightly creamy, fruity flavour with vegetable charcoal running dramatically through its centre. Or look for a semi-hard cows’ cheese with fruity character. Cut the Poulet de Bresse into 8 pieces and remove the breastbone. You can ask your butcher to do this. Rinse the bones and put in a pan with the bay leaf and the trimmings from the carrots, celery and onion. Cover with cold water, bring to the boil and simmer for 1 hour. Strain through a sieve and set aside. Meanwhile, season the chicken pieces with salt and pepper. Dust with fl our. Put the oil in a cast-iron casserole dish over a medium heat until hot. Add the chicken and fry for 10 minutes until golden brown all over. Remove from the pan and set aside. Drain the fat from the casserole dish, return the dish to the heat and add the butter. Add the carrots, celery, onion, garlic and thyme. Sweat for 5 minutes until brown. Clean the mushrooms and cut into chunks. Add to the veg, season with salt and pepper. Return the poulet to the casserole and add the sherry. Increase the heat and cook for a few minutes until the alcohol has evaporated. Add the prepared stock, cover the casserole dish and cook in the oven for 90 minutes. For the mash, peel and cut the potatoes, celeriac and parsnips into chunks and put in a pan of cold, salted water. Bring to the boil, reduce the heat and simmer for 15 minutes until tender. Drain and put in a pan with the butter. Mash well, season and keep warm. Take the casserole dish from the oven and remove the chicken and mushrooms to a serving dish with a slotted spoon. If the sauce is too thin, put the casserole on the hob over a medium heat until the sauce has thickened. Add the crème fraîche and Morbier. Stir well. 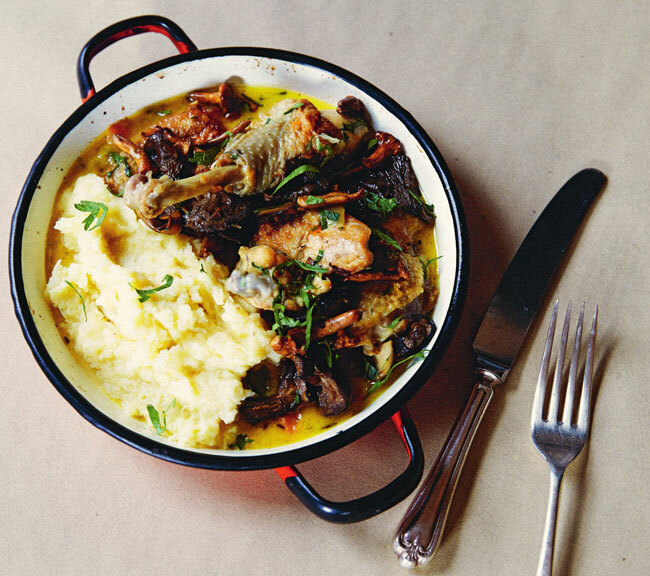 Serve the poulet, mushrooms and mash topped by the sauce and a sprinkle of tarragon. An extract from ‘A Year in Cheese’ by Alex and Léo Guarneri originally published in FrenchEntrée Magazine.